The highlights of what we offer at Coastal Elegance; the Isn’t It Romantic package, covers all of the important details of your Myrtle Beach wedding day. 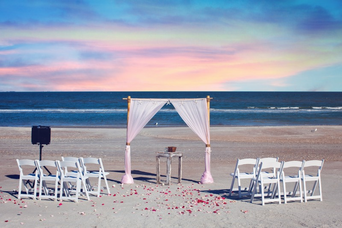 Along with the basics we provide (officiant, photographer, flowers), we will include music, a heart in the sand, detailed wedding decor, a pop of color and the sand ceremony. Let’s not forget your bridal garter and the ring pillow and flower basket for those special little ones! As always, an hour of professional photography is included.